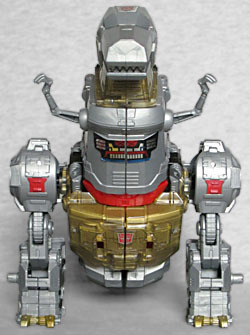 The strength of the Dinobot leader Grimlock is legendary. His prowess in battle is unrivaled. He respects strength beyond all else, but he doesn't like bullies. It's this that fuels his dedication to fight against those who would use their power for evil. Maybe it's because I don't care at all about Grimlock, but it seems like he's constantly getting new toys, like you can barely turn around without bumping into another one. But then I go back and look through our archives, and the last one that was definitively him was in 2006 - there have been other Grimlocks, but they've all been from the movies or videogames, or just been exclusive repaints of those toys meant to homage G1. This, though, is the real thing. If there's one innovation all "classic" Grimlocks should adopt, it's the teeth on the sides of his faceplate that Don Figueroa designed him for The War Within; keep all the other cranial details from the old toy - the flat things over the ears, the red eye visor, etc - but give him the teeth. It would make the face more interesting than it is. Grimmy is, as he should be, a big, beefy-looking robot. The chest is broad and blocky, and the shoulders and forearms are massive. The legs look slightly "off" somehow, and though it took a little time to figure out, there is a reason for it: rather than being centered on the lower legs, the knees are against the outside edges; that means there's more bulk on the center of the legs than on the outside, which makes him look... dainty, almost? 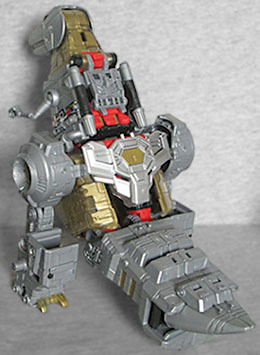 Think back to G1, or even just to the Masterpiece release - Grimlock's shins got wider as they dropped from the knees to the feet, but that was on the outside, giving him a wide base and making him look stable, which is exactly what this toy is missing. The figure's articulation comprises a balljointed head, swivel/hinge shoulders, double-hinged elbows, a swivel waist, swivel/hinge hips, and swivel/hinge knees. The ratchets in the shoulders, hips and knees are very stiff, because they need to be, but there's a hinge in the waist (used not in this mode, but later) that wants to fall open at the slightest bump. 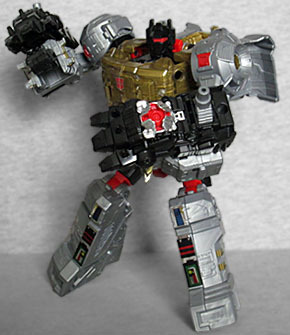 He doesn't have his traditional weapons, a sword and a double-barreled gun, but he does still include some accessories: Power of the Primes has brought back Combiners, but thanks to a change in the way Combiner Wars handled its feet, Grimlock includes two pieces of "Prime Armor," black lumps that can plug onto his arms like giant knuckle dusters. 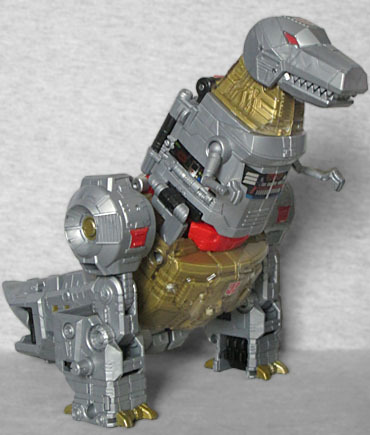 Grimlock turns into a T. rex, of course, and the conversion is pretty much the same today as it was in 1985: the arms become the legs, the legs become the tail... you could probably figure it out without even looking at the directions. Rather than a horizontal posture, like the past few Grimlocks have had, this one regresses to the old, upright, tail-dragging stance. Because if things aren't excatly as you remember them from your childhood, then the terrorists win. Fortunately, if you simply must have him stand like a real Tyrannosaurus, the articulation will allow it - all the arm joints still function, even though they're not in the legs, plus ends up with a hinge joint in the tail and another in the neck. His jaw also opens and closes, and the shoulders on his baby arms are balljoints. The proportions of the dinosaur are a bit off. The robot's arms don't push into the torso at all when you convert him, so the legs end up floating weirdly far way from the body. 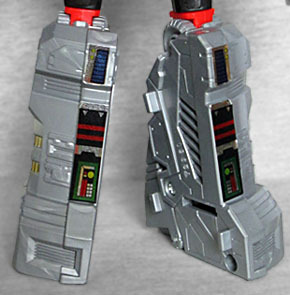 Additionally, the tail is oddly thick and blocky - the '80s version formed the tail by flipping the legs 180°, which is how those big feet could still lead to a tapering tail. Without that step on modern figures, the tail never looks good. The back of the dino is a mess, too. It's not that there's a lot of kibble, per se - it's not like robot parts are hanging off his back - but there's definitely nothing covering up all the exposed robot surfaces. It's like they forgot to design a back for him (which probably means there's some third-party group working on one right now). A lot of his colorful details are done via sticker, because that's what Hasbro's into right now, and just like the rest of their attempts, it's disappointing. The Prime Armor can attach to the dinosaur's legs, but it doesn't look very good there. Shame there's no way for him to carry it on his back! The set also includes a Dinobot Enigma of Combination, which is just a hollow lump of plastic sized like a Titan Master or Prime Master. 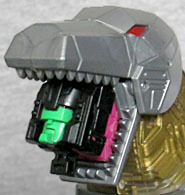 It doesn't do anything, but Grimlock can hold it in his mouth - which means he can also hold any of the Titan Masters in his mouth, too. Eat those smaller robots, Grimlock! Eat them all! Power of the Primes Grimlock is not a great toy, by himself. 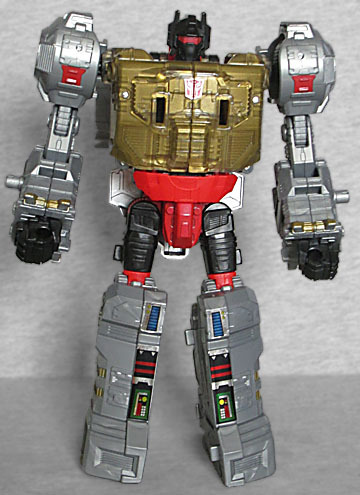 Yes, some of his flaws are related to the fact that he also has to turn into a torso for the Dinobots' combined mode, but there are others that are just straight-up design issues.